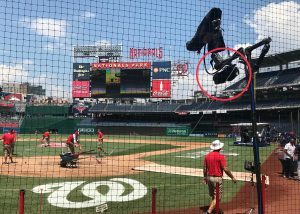 Having made its first MLB All-Star appearance in Miami last year, the team from C360 was back with Fox Sports at Nationals Park this week. Two C360 6K+ (25X HD) 60p camera systems provided 360-degree outputs: one at low home and one attached to the SkyCam system in left field. One of two C360 360-degree 6K+, 60p camera systems on hand at Nationals Park was located at low-home. 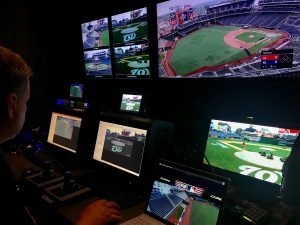 At All-Star, Fox had the ability to integrate the low-home PTZ position live into the telecast, as well as for replays with full stop-action and zoom capabilities. The C360 workstation at MLB All-Star drove positions at low home and on the SkyCam in left field. In addition, the SkyCam system provided an immersive live stream to a YouTube 4K channel delivered to an offsite Fox VIP event. This stream allowed the viewer to virtually navigate the entire field with a touchscreen tablet. In addition, the experience integrated Fox Sports’ linear video feed and ticker above the field in the virtual ballpark. The C360 system continues to evolve, having just added 60p capability. So do the applications it can be used for. For example, a C360 system was used courtside at the NBA Summer League this month in an effort to replace the mid-court handheld that has largely disappeared from live telecast because of increased courtside seating.